The Rasmuson Foundation, Alaska’s foremost charitable family foundation, has awarded a grant of $24,422.00 in support of the construction of the Elders’ Bell Tower at Saint Herman Church in King Cove, a remote fishing community of about 950 year-round residents located near the southern tip of the Alaska Peninsula. 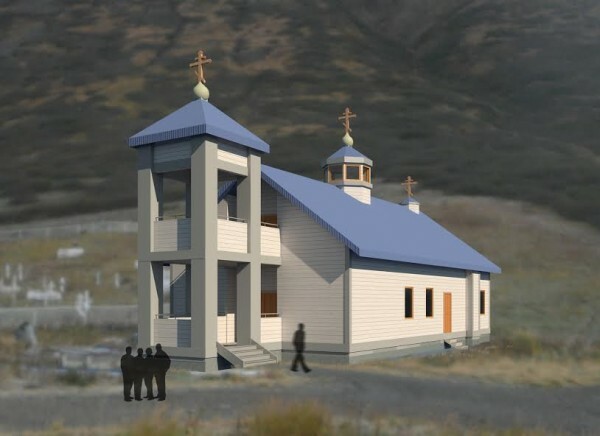 Architect’s concept of bell tower and restored King Cove church/ Credit: Architects Alaska, Inc. The Elders’ Bell Tower will be a freestanding tower, approximately 30 feet high, designed to house King Cove’s seven historic bronze church bells, cast in San Francisco in the 1880s. Originally the bells were housed in Holy Resurrection Church in Belkofski, AK — a once-thriving Aleut village with a richly adorned Orthodox church. Gradually the residents of Belkofski moved to nearby villages which offered them new economic opportunities. The church’s rich inventory — including a beautiful iconostasis containing numerous icons from Russia — was transferred to King Cove, 12 miles away by boat, where a new Orthodox church was built in the 1980s. Due to the often punishing weather of the lower Alaska Peninsula, where wind gusts of 70 mph and more are not uncommon, it is especially vital for the bell tower’s design to be precisely engineered. The largest bell has a diameter of 35.5 inches and weighs an estimated 850 pounds. A steel frame and deep, secure foundation are two elements of the future tower now being considered by planners. The project relies on the participation of volunteers to provide the labor. A team of four men from the Sacramento, CA area is planning to return to King Cove to oversee the tower construction in 2016. These generous volunteers are no strangers to King Cove — they came in the summer of 2012 and stabilized the church, which was in great need of emergency repairs. The volunteers are of Russian heritage and find inspiration in travelling to Alaska to restore a church with history dating back to the Russian period in Alaska’s history. Through the building of the bell tower, the local faithful hope to promote the importance of historic and cultural preservation in a part of rural Alaska in which many visible signs of Russian influence have disappeared. For many, especially the elders of the community who grew up in Belkofski, the Orthodox Church is a tangible connection to both their cultural and religious heritage. For the younger generations, the church offers a glimpse into the rich history of both their region and faith. By dedicating the bell tower to the community’s elders, the parish seeks to honor and thank them. “The bell tower is a way of bringing people together and celebrating our community’s heritage,” says Priest Andrei Tepper, Rector of Saint Herman Church. “We are a people of faith, and restoring the bells shows that we are serious about preserving the historical items that have been passed on to us. We want to be good stewards, and this is an important step towards protecting and preserving our heritage, our inheritance, our faith. “We are so grateful for all the generous donations we have received from individuals, parishes, and organizations throughout Alaska and the Lower 48 in support of our restoration,” he added. The Rasmuson Foundation’s financial contribution challenges the community to step up and raise a matching amount before the end of the grant period towards the church’s final fundraising goal. The parish expects that the bell tower construction will be the first phase of an overall rehabilitation project for the King Cove church. Further funds are needed to continue the reconstruction over the coming years. Donations are tax-deductible and may be sent to Saint Herman Church, PO Box 169, King Cove, AK 99612.